It's day 2 of Thanksgiving leftovers, and already I'm getting a little tired of just reheating the dishes I served on Thursday. Time for something else! 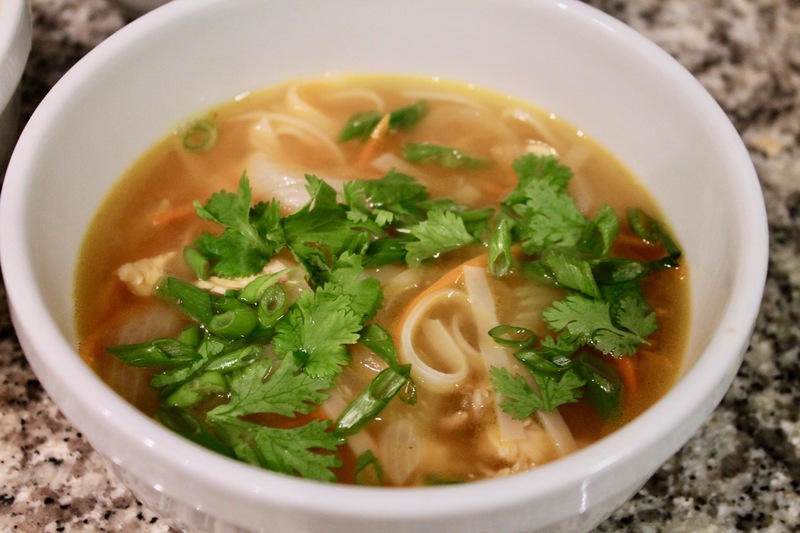 Early in the day, I thought about making a simple turkey-noodle soup. I'd already thrown out the carcass, so there wasn't going to be a "make your own stock" situation at my house (I know I should save it and use it, but the last few years, it just sits in the freezer). I thought I'd making something simple with cooked turkey, onion, celery, carrot, egg noodles and turkey broth. But then it dawned on me that with some Southeast Asian flavors, I could probably make something just as satisfying and a lot more interesting. In went the ginger, garlic, star anise, fish sauce, soy sauce, lime juice and cilantro. The results were a big hit around the table. Home run! 1. Place the rice sticks in a bowl and add boiling water until the noodles are submerged. Allow to sit for 5 minutes, then drain the noodles. 2. Heat oil in a Dutch oven or large soup pot over medium heat. Add the onion and celery, and sauté until softened, about 8-10 minutes. Add the carrot, garlic, ginger and white scallion parts, and cook another minute until fragrant. 3. Increase heat to medium-high and add turkey broth, star anise, fish sauce, soy sauce and white pepper. Bring to a boil, then reduce heat to simmer. Add the turkey and simmer over medium-low heat for about 5 minutes. Turn off the heat, remove the star anise pods, stir in the lime juice and adjust seasoning to taste. Stir in the cooked noodles. 4. Serve in bowls garnished with a good pinch of cilantro leaves and green scallion pieces.